"Tomb of Chinese president Cao Kun"
Tomb of Chinese president Ts’ao Koun (Cao Kun曹錕, 5th president of the Chinese republic) in Beijing Fragrant Hills. From left to right: Fr. Wang, CM, of Beijing; Raymond de Jaegher; seated Bp. Pierre Cheng程有猷 of Xuanhua; Fr. Jean-Baptiste Fan 樊, pastor of Anguo; Fr. Paul Gilson. 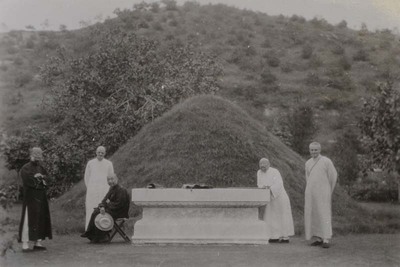 Tomb of Chinese president Cao Kun. August 1933. Société des Auxiliaires des Missions (SAM) China Photograph Collection, Whitworth University Library, Spokane.